My daughter recently brought up the subject of UFOs at the breakfast table. We’d been watching some films about Apollo and her Grandmother had been telling her about some new conspiracy-theory conflation of UFOs and the Apollo hoax that she’d watched on TV, so I guess she’d been thinking about it for a while. I explained that whilst I am very skeptical of the idea that UFOs are alien spaceships, I do believe in UFOs in the literal sense, because I’ve seen one. At this, my daughter raised her eyebrows in genuine (and rare) surprise and re-appraisal. Here was something about boring, garrulous old Dad she didn’t know. So I thought it might be an interesting experience to share, as my UFO moment was a bit different from the usual misidentification of Venus. 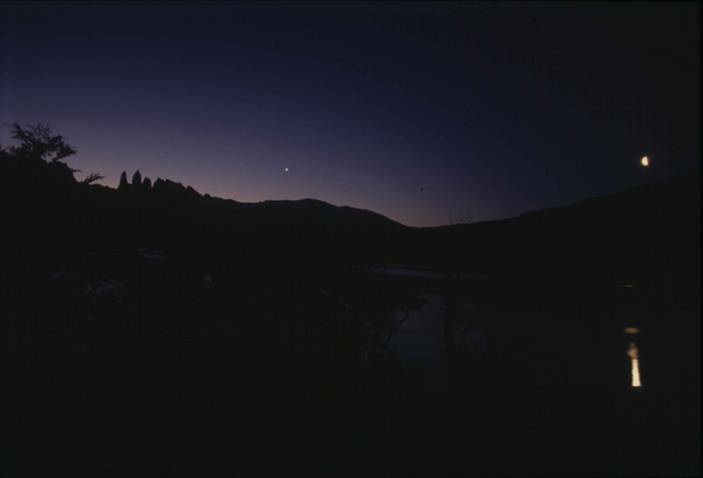 No UFOs here: Paine national park at dusk, with Venus and The Moon reflected in Lago Azul. It gives some (but not much) impression of how beautiful the scene was on New Year’s Eve 1992. The early 90s were a strange time for me. I was trying to hold down a job (relevantly, one that brought me in contact with a lot of military pilots), whilst travelling all over the world researching a book I was writing about volcanoes. The previous summer had seen me in the Pacific Northwest of the US, visiting Mount St Helens and Yellowstone, whilst I had spent a fascinating month in the Patagonian Andes over Christmas. The trip to Patagonia had taken me through dust storms of volcanic ash (the type that shut down flights recently) from mount Hudson, through the howling winds and treeless buttes of the prairie and over mountain passes past turquoise lakes and shimmering glaciers. At the end of the trip, on New Years Eve, I found myself camped in a group of stunted Lenga trees, next to a field of huge white daisies, on the shore of Lago Azul in Paine National Park. I believe Paine has been developed since, but back then it was a serene, remote place of dirt roads and lakes so clean you could drink out of them. As dusk fell behind The Towers – impossibly jagged peaks that rose beyond the lake – the sky got progressively inkier and the upturned first-quarter Moon and close-by Venus and Saturn glimmered gorgeously in the lake. Eventually it would darken into one of the most pristine skies I have ever seen (find Paine on a map and you’ll see why – it’s just north of Cape Horn), but at dusk I tried to take photos that would capture the combination of the dusk sky, the lake and the mountains; but of course I couldn’t. Later that evening, with the mid-Summer sky slowly turning darker and darker shades of indigo overhead, huddled around a campfire, we got drunk on cheap Chilean wine and ate “assado” (barbecued steaks) from the griddle. Some other people turned up – guides from a tour group - and we got chatting. Eventually the conversation turned to “where you would like to visit most in the World” and I said that (apart from where I was right then), I wanted to visit Kamchatka. Kamchatka is so familiar to me now that I forget just how little known it is. Back then, just after The Wall came down, it was even more exotic and mysterious. Closed even to ordinary Russians during the Cold War, it remains a place of listening posts and secret installations, home to the base for the Russian Pacific submarine fleet. But the reason I wanted to go to Kamchatka back in 1992 was that it is one of the most beautiful, unspoiled and volcanic places on Earth. Separated even from Siberia by a huge sea, Kamchatka is nine time zones and what must be the longest internal flight in the world East of Moscow. Kamchatka is a vast peninsula, a land of grizzly bears and huge volcanoes cutoff from the rest of Asia; there is no route in by land. I had seen a brief film about the place as part of the BBC series “Realms of The Russian Bear” and been hooked, but had been unable to find a way to get there. Just a year or two previously the explorer Christina Dodwell had written a seminal travelogue about her experiences in Kamchatka, a book entitled “Beyond Siberia”. I explained all this, doubtless slightly garrulously and drunkenly, to the Tour Guide as we tried to keep warm around the camp fire that New Years’ Eve in Patagonia, stealing glances back at the silhouetted Towers, and that lovely Moon. At least I think that was what I was stealing glances at. In fact the Tour guide was, how can I put this, not unattractive, so maybe it wasn’t, but she was friendly nonetheless. She surprised me by saying that not only did she know where Kamchatka was, but the adventure travel company she worked for was trying to arrange the first ever Westerners’ trekking trip there and would I be interested? I’ve been to Kamchatka quite a few times now and you still have to travel via Moscow, but that first time it was a real adventure. Moscow has changed out of all recognition since, but in those days the hotels were brutalist marble cathedrals and the shops were empty, the roads potholed. I have reason to remember these details because we were stuck there for days, shuttling to and from the airport trying to catch flights that got cancelled. And that wasn’t the end of the problems. Having finally left Western Europe , we landed prematurely in a place of endless flat Taiga forests that looked nothing like the Kamchatka I had imagined… because of course it wasn’t Kamchatka. It was Magadan, a dismal place in northern Siberia on the wrong side of the Sea of Okhotsk, famous for being the start of the Road Of Bones to the Gulags. Having been stranded for hours on the concrete of a mosquito-raddled runway, it looked like we were stuck. The plane was out of fuel and none was forthcoming. Remarkably, though, the day was eventually saved by a Submarine commander in a leather trenchcoat and berret who looked like Stalin (honestly). Hours earlier he had strode off up the runaway towards far distant buildings, mutteringly angrily. Finally, he arrived back at the wheel of a huge green army fuel truck with a big red star on the side and set about refueling the plane. I learned that in Soviet Russia, if you wanted something done you did it yourself. Two weeks of amazing trekking up active volcanoes, descents into ice caves and confrontations with bears later, we were exploring Kamchatka’s central volcanic group. We had taken a day to scramble up and down chains of small volcanoes made of black cinders in an area devastated by eruptions in the ‘70s. It was a spectacular landscape, genuinely Lunar with nothing but black cinders for miles. There were no living plants and the black landscape even had impact craters made by volcanic bombs. If you ignored the distant views of snow-capped volcanoes, you could have believed it was the Moon and in fact they tested the Lunokhods there. The cinder cones looked dead, but we found places where holes in the ground steamed and smelt of sulphur and chlorine, where black lava had corroded to orange and yellow. The views from the tops had been incredible too, of volcanoes like Tolbachik, Kamen and Kluchevsky, the latter higher than Mont Blanc. 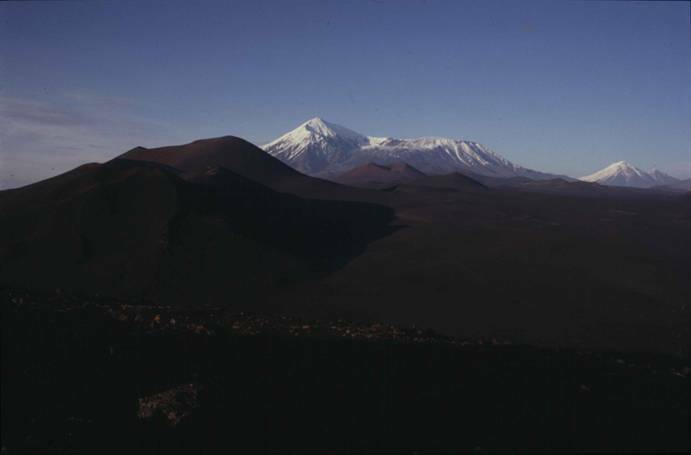 The landscape of Central Kamchatka: Tolbachik volcano in the background; an almost-Lunar desert of black cinders in the foreground. So that evening the trekking group felt tired, but elated, as we skiied down slopes of black cinder back to the group of olive-drab Russian army trucks and tents of our camp that had looked disconcertingly like toys in the distance. We were perhaps thirty miles from the nearest human being; the most empathy I’ll ever have with Buzz and Neil. As night came, nothing moved in the black and blasted Moonscape around. At least we had a group of dead trees for fire-wood, all bleached like bones sticking out of the ash. It was somebody’s birthday that day, so a party was in order. The trucks were clustered around the fire, headlamps pointing in to give us some light (no Moon that night, just blackness and stars – central Kamchatka is total wilderness). Pretty soon the Vodka came out and we were having fun; our guides, the local geologists, were a tough lot, but friendly and a few shots later they were rolling around singing drinking songs. They had just finished one, a traditional submariners’ ballad to a nuclear reactor which is melting down, when someone near me noticed the light in the sky. A circular patch of white haziness hung in the blackness and sparks above the campfire, just as if a torch were being shone into the smoke, or a bit like M57 seen through a big ‘scope. One of the Army trucks was running and its headlights were on; I thought the glow was someone playing with the roof-mounted searchlight. ‘UFO!’ said one of the Russians pointing. ‘Yeah, yeah. Very funny. Turn the truck lights off.’ I shouted above the hubbub. Other people had noticed it now and were pointing skyward. Then I realised something that made my explanation impossible. In the middle of the glow was a star; it was moving slowly across the sky like a satellite, taking the hazy halo with it. The truck lights and all the torches were switched off and the party stopped in mid flow. It was suddenly obvious that this was no practical joke. We watched the light in silence as it grew in brilliance, crossed half the night sky, then faded and died. Accompanying its passing was no sound, no colour, nothing resolvable aside from smoke ring and star. We all stood there gaping; no one thought to take a photo (and in fairness this was in the days pre-digital and no ordinary film would have been fast enough to do the job anyhow). So had we just experienced a bona-fide group VIH (Vodka Induced Hallucination), or just a boring old UFO? Afterwards, everyone was talking and shouting at once, excited and spooked. When the furore died down, all we could come up with (and we happened to have a research Astrophysicist on the trip) was that it had been a rocket launch. The theory involved the exhaust gases producing a luminous halo around the rocket motors which were the central 'star'. The problem is that Kamchatka, so far as I know, has no rocket launch site and when I researched it later could find no evidence of any launch on that date from anywhere. I now suspect that what we saw was a (probably secret) missile test. Kamchatka is on the Russian border closest to the USA (the Aleutians lie a few hundred miles to the East) and there are numerous military installations scattered about the peninsula. Or perhaps it was the afterburners and exhaust gasses of a high altitude interceptor climbing into the stratosphere (I have seen rows of Mig 25s lined up outside bunkers at the airport).